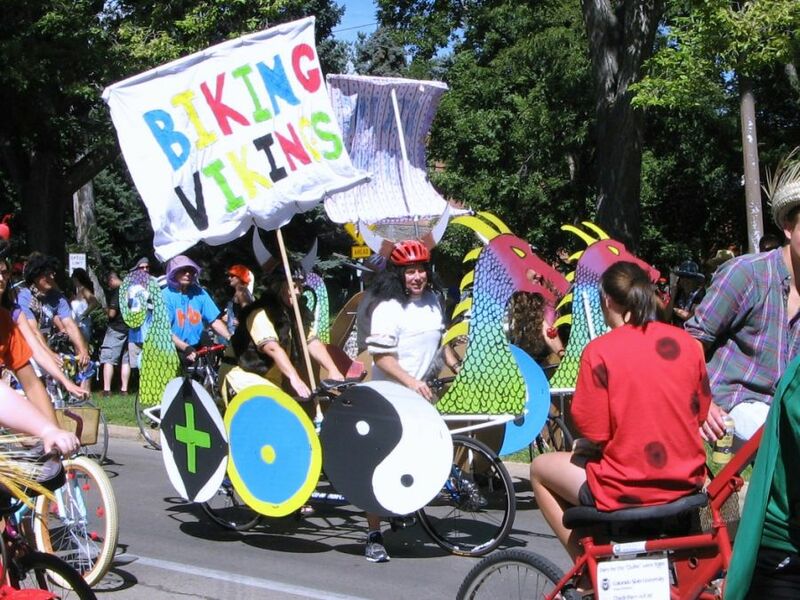 After living in Fort Collins for eight years, I finally attended the Tour de Fat* parade for the first time this year. For those who’ve never heard of it, the Tour de Fat is family friendly charity event put on by New Belgium Brewery to promote cycling. It’s held in cities all over the country, but as home to New Belgium and the first Tour de Fat ever, the Fort Collins version of this 15-year-old event is special. 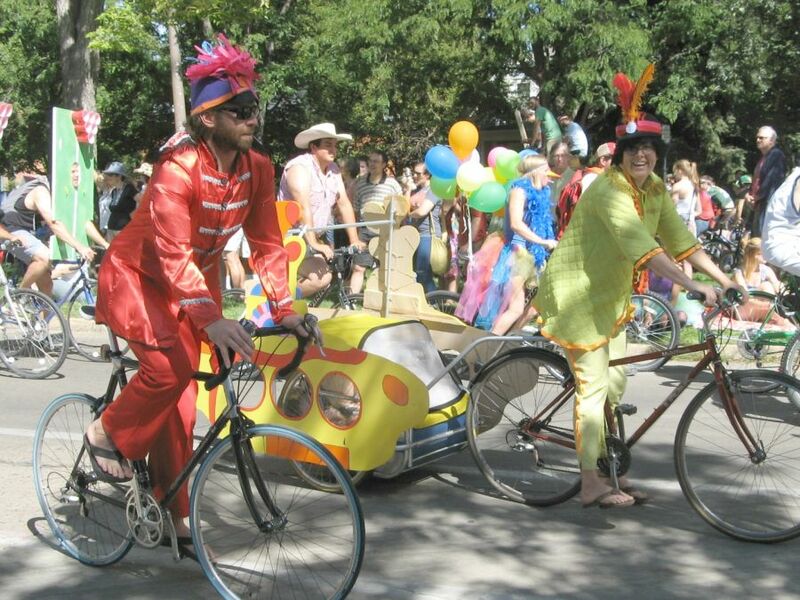 Part of the day-long festivities is a parade of people in costumes on bikes. We watched thousands of people ride past us in everything from a hat and boa to a full body gorilla costume. 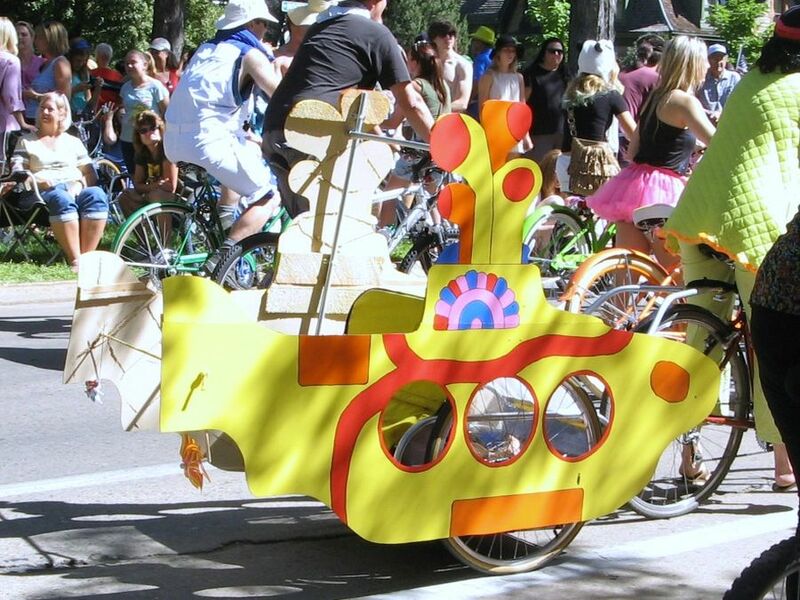 Some people rode unusual bicycles, others dressed their bikes up as well as themselves. I came home with hundreds of photos from this event and I want desperately to share them with you. I found the creativity, dedication, and humor shown in the costumes inspiring, but I have too many pictures for a single post. For today, we’ll look at people who made decorating their bikes part of their outfit. Biking Vikings! I think those are tandem bikes turned into longships. Many people turned their bikes into other modes of transportation. There were horses, unicorns, covered wagons, canoes, and, my favorite, viking long ships. Since lots of families participate in the parade, anyone pulling a trailer behind them had an opportunity to make it part of their costume. My two favorites were Velma in the Mystery Machine and the Beatles’ Yellow Submarine. Velma and the Mystery Machine. 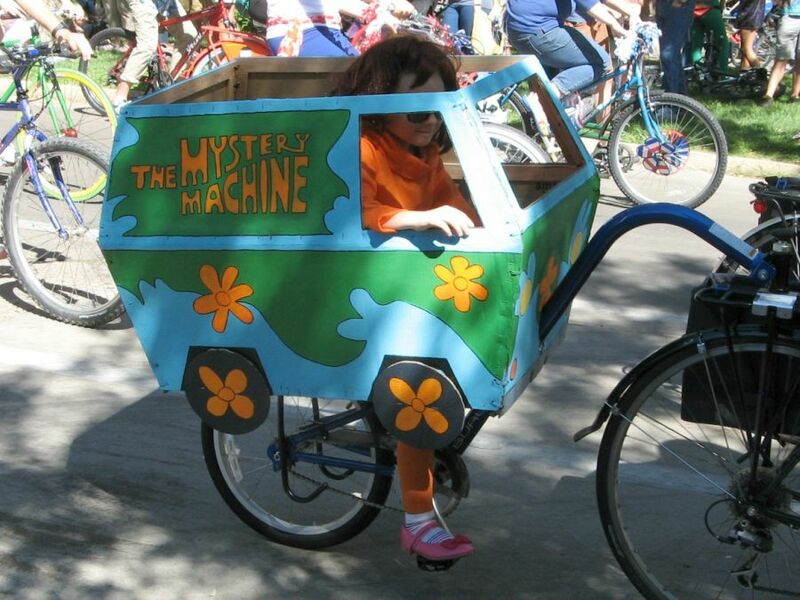 I think the cyclist was dressed as Fred, but since I didn’t get a photo, I can’t be sure. Two band members plus a yellow submarine. A better look at the Yellow Submarine (isn’t it awesome?). In a few cases, the bicyclist went big. 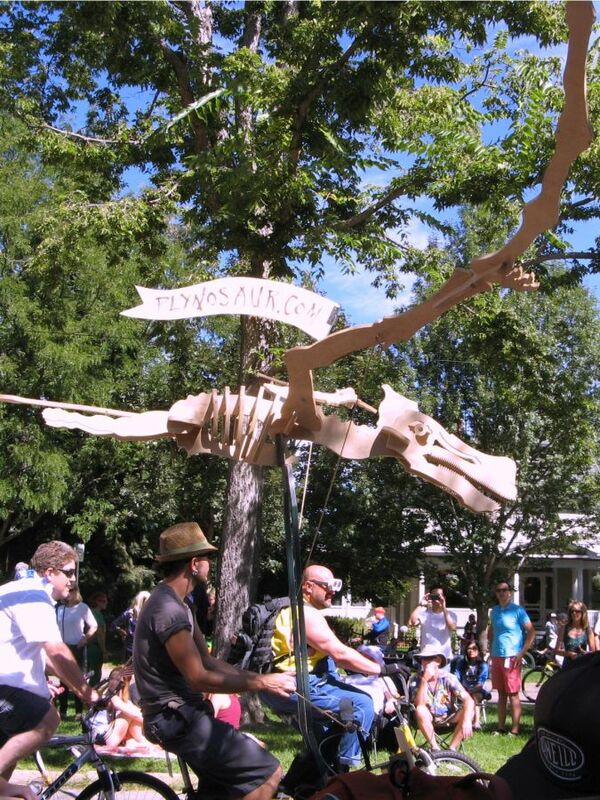 One of these was a plywood pterosaur that passed well over the heads of the crowd, wings flapping, while the bicyclist pedaled below. Plynosaur, complete with moving parts. But the show stopper for me was a giant AT-AT from Star Wars, as seen in the beginning of The Empire Strikes Back. A single dedicated woman pumped away on her bike to move this monstrosity down the street. Between the extreme construction and the effort it took her just to get the thing down the road, she deserved a prize. 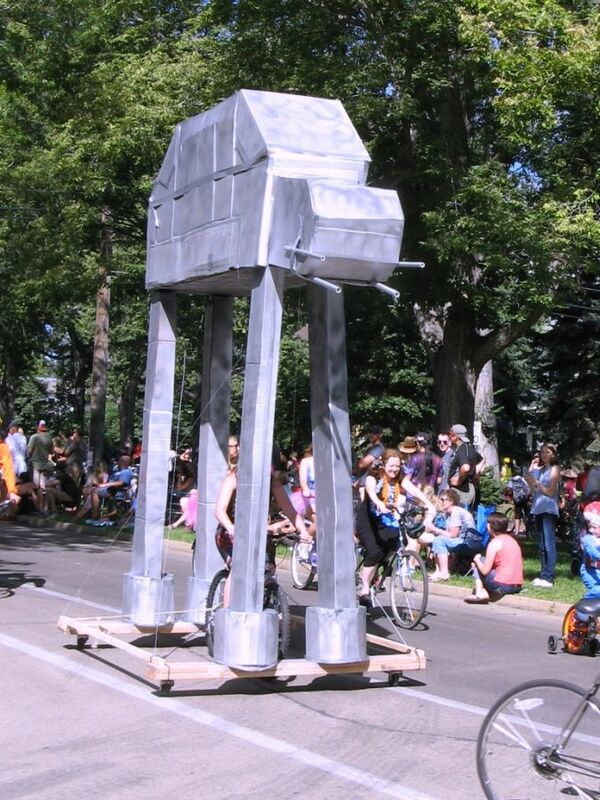 My favorite: A cyclist powered Star Wars AT-AT. You had to see it to believe it. *”Tour de Fat” is a combination of the name of a famous bicycle race (Tour de France) and one of New Belgium’s beers (Fat Tire, named for a kind of bicycle). It is not the bike race for fat people. In case you were wondering. Photography by a 4-Year-Old: Is It Art? That baby mystery machine is precious.